Adorable 5 bedroom, 2 bath oceanfront cottage with large open living and kitchen area with bedrooms on either side. Amenities include central heat and air, fully equipped kitchen with dishwasher and microwave. Living room has vaulted ceilings with large flat panel television and DVD player. A washer/dryer is located on the ground level for your convenience. Wireless internet access, phone, and stereo with CD player. 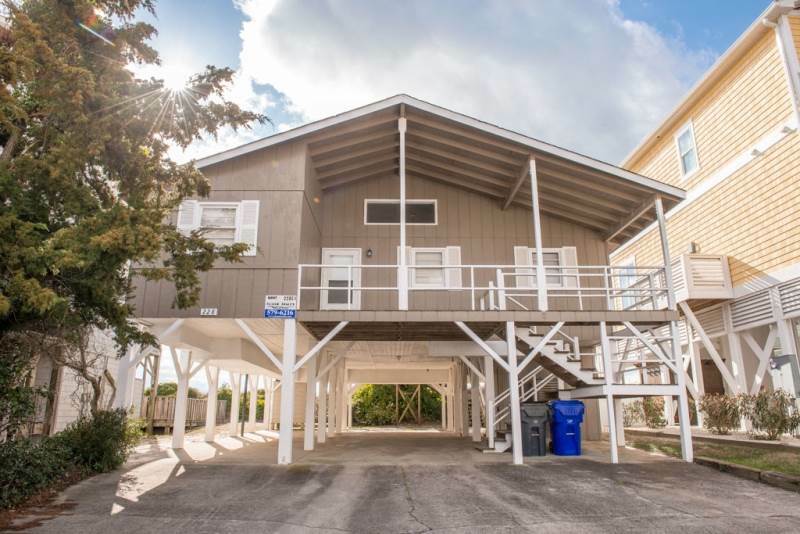 Charcoal grill, covered and uncovered porches, and an enclosed outdoor shower with private walkway to the beach make this oceanfront vacation easier! Non-smoking. No linens included in this rental. Accommodates 14. Bedding: Double/Single, Double/Single, 2 Doubles, 2 Doubles, 2 singles in small 5th bedroom..
We shared the cottage with another couple. The house met all our needs. It was basically clean, but bathrooms need to be updated. We saw 3 dead roaches, none alive. We would rent this cottage again however. Nice open living space. Was great for a family get together. Large table and breakfast bar plenty of seating space for meals. Child safe deck on the back with plenty of rocking chairs closely spaced rails and gate. Nothing fancy its a comfortable, airly beach cottage with beautiful ocean veiws. Plenty of parking too.